FHW's second film production, a series of four half-hour documentaries written and directed by Dimitris Loukopoulos, is entitled Asia Minor... Echoes of Memory. Each documentary follows the dramatic dialogue of two voices (or two souls) that travel through time and space in search of their roots. These invisible narrators journey from antiquity to the present day, from city to city, uncovering, as they pass, the rich cultural mosaic that forms the history of Asia Minor. The films are complemented by 3D reconstructions of monuments, such as: the temple of Athena in Assos, the altar of the temple of Artemis Leukophryene in Magnesia, the Agora and the Bouleuterion of Miletus, the port of Knidus and three buildings of worship at the acropolis of Xanthus. The videos are for sale at the Museum Shop, in the Cultural Centre of FHW, as well as other locations in Greece and abroad. For further information contact the Museum Shop of the Cultural Centre, tel. 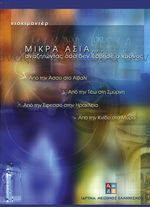 : (+30) 212 254 0000 or write at sales@ime.gr.